Rover the Golden Retriever needs your help in finding his diamond doggy bones and jeweled collar. Click here to play! He's misplaced them and is now searching far and wide. If you can manage to find these extravagant doggy accessories, you'll find yourself with a few extravagant deposits to your account. Rover will lead the way in this hunt. He only appears on reels 2, 3 and 4, but he'll substitute for most other symbols on the board and will double prizes when he appears in a winning combination. You'll surely need his help if you want to make the most out of this treasure hunt. His gal pal Delia the Daschund will appear from time to time to help you in the search. If you get two to five of her across a winning line, you'll get 2500 times your original line bet. Not too shabby. Five dog houses pays out 1000 times your bet. There are plenty of other symbols that will make your search more interesting, including jeweled collars and water bowls. As you're in search of the diamond Doggy Bone, if you spin three or more of these symbols anywhere on the board your total bet will be multiplied accordingly. Three or more also award bonus prizes so be sure to keep a close eye out for these treats! Help Rover recover his doggy bones and watch the cash come rolling in. The diamond doggy bone acts as a scatter. It can award you up to 250 times your total line bet. Three or more of these icons will trigger ten free games. 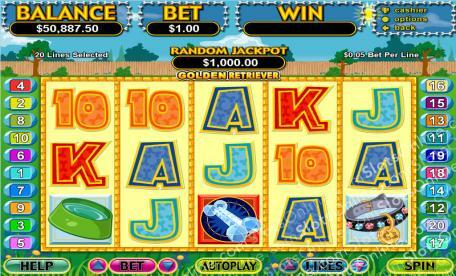 At the end of your free games, the Golden Retriver will dig for bones to reveal a multiplier. Your total win in the free games will be multiplied by whatever the Retriever digs up. The slobbery Golden Retriever will substitute for all other symbols excluding scatters. He only appears on reels 2, 3 and 4, but will double your prizes when he appears in a winning combination.